Our business is Executive Search. We recruit for international executive and high-level specialist positions. We focus on lifestyle markets: industries such as fashion, sports, shoes, jewellery, accessories, cosmetics and home living. Our expertise is selection. We build on professional research, excellent background knowledge about people, companies and the market and, last but not least, professional diagnostics tools. We match the right people with the right positions for you. This is what SUITS. stands for. Having the best people is the key factor in rising above the competition. We seek, find and win over these decision-makers for your business. In this age of social media, identifying candidates is no longer the problem. The art is in finding the right approach, assessing how they fit and winning them over for a particular role. This is where our expertise lies. As industry specialists we know the market. We know how the market is developing and what demands this entails for decision-makers. This makes us competent sparring partners – for clients and candidates alike. Personally we are very well connected and have excellent access to the movers and shakers of the industry. Our systematic approach enables us to complete our searches as efficiently and quickly as possible. Executive Search clients can participate in SUITS.Connect free of charge on request. This gives our clients exclusive access to the SUITS. candidate network. We always remain aware of our great degree of responsibility. Discretion, reliability and commitment form the basis of the long-term cooperation for which we strive. Not least, SUITS. embodies the standard we set for ourselves: that everything fits just right. For the company and the candidate alike. So ultimately everybody wins. We work for globally active brands and international retailers as well as family businesses and local players. Other clients include fashion industry service providers such as management consultancies, agencies and media as well as private equity firms. Our starting point is usually recruiting for positions with six-figure annual salaries. We generally agree a fixed fee. We only work on an exclusive basis, and not for performance-related compensation. We only take on mandates we can actually fulfil. Our goal is to complete the project within 90 days. We only work for clients who can keep up with our tempo. A detailed job profile forms the basis of our work. This factors in current and future requirements due to how the market develops as well as the cultural context of the company. This is where our extensive industry expertise pays off. We submit a substantiated recommendation. Using tools we have developed ourselves, we are able to see a candidate’s potential as well as their current position. This includes an obligatory, free personality test that supports the professional and personal assessment of candidates by the consultants. We will also gather references on request. We adopt a systematic and efficient approach. Regular updates ensure maximum transparency. We organise all meetings and travel arrangements. We donate a fixed percentage of our annual profit to charitable causes. In particular we support a foundation that assists the next generation of talent in the industry, the Wilhelm Lorch-Stiftung. With team spirit and muscle commitment we ran at the B2RUN company run event in Munich. 8 o’clock. In the morning? With SUITS. Diagnostics, the Munich personnel consultancy integrates psychological aptitude assessment procedures into its selection processes. 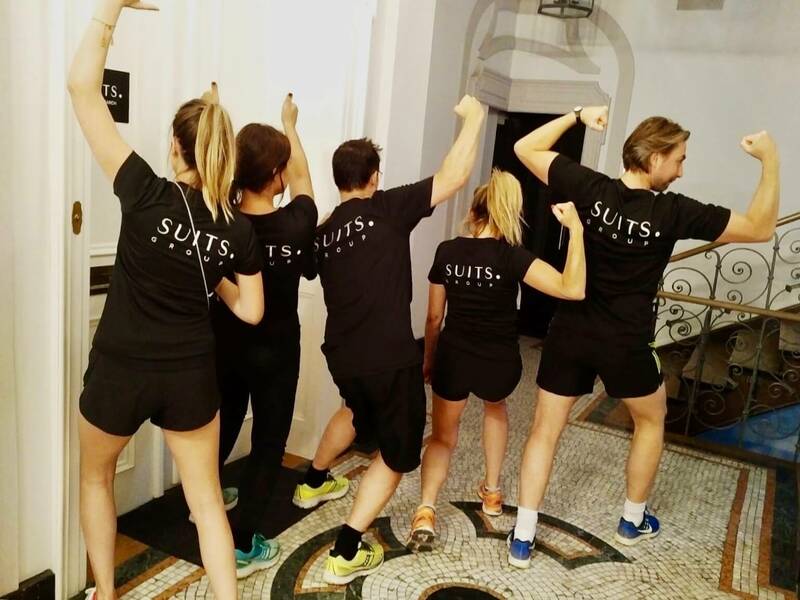 Premiere for the SUITS.Salon: Some 40 hand-picked guests were invited by SUITS. to the warehouse of Mytheresa.com in Kirchheim near Munich and were impressed by the facility opened this March. Does everything have to be digital? 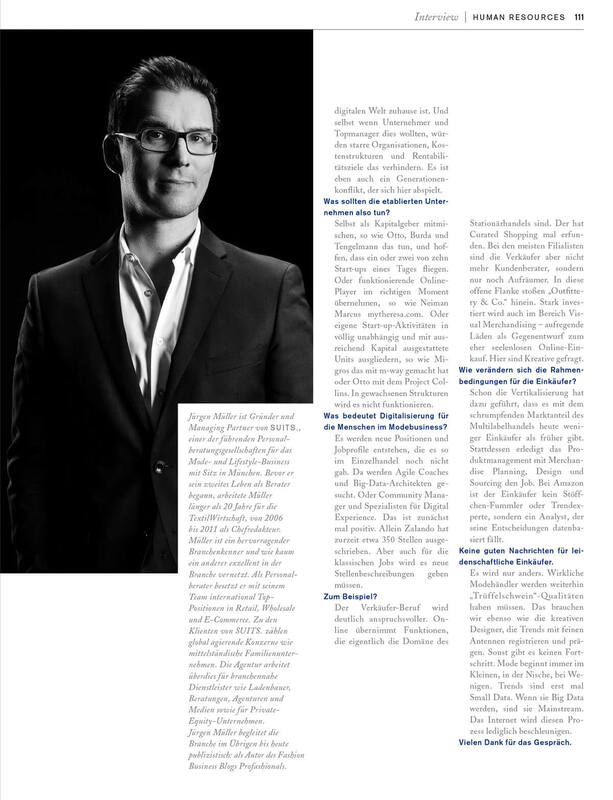 Jürgen Müller talks about fashion fairs in Berlin and today’s challenges for retail trade in the Panorama magazine. You don´t stand a chance! Use it. Family & Friends at SUITS. Grand opening of our office in Munich. Job opening at SUITS. – to begin as soon as possible. As of September, Claudia Otte is the latest Consultant to join Jürgen Müller’s team. This week SUITS. Executive Search is launching a new programme for recruitment to middle management and specialist positions: SUITS.Connect. Join our team! Are you excited about the fashion and lifestyle business and looking to get to know this fascinating industry first hand? SUITS. attaches great importance to the protection of your personal data. Both the protection of our candidates’ privacy and the protection of our clients’ personal data is of particular and high importance to us. In accordance with the applicable data protection regulations of the Federal Data Protection Act (BDSG), this data is treated very carefully by us. As far as you have made personal data available to us, we use these only for the answer of your inquiries and for the completion of the agreed service. We assume that we can use your personal data for an indefinite period of time, provided that the statutory provisions do not prevent this. Your personal data can be accessed, processed and transmitted in strict confidence by all SUITS. employees as well as by all offices, licensees and affiliated companies worldwide. If we transfer your data to countries outside the EU, we will inform you comprehensively about the risks of the transfer. The data is only passed on to companies cooperating with us under contract. Your personal data will only be passed on to third parties if this is necessary for the purpose of the agreed order processing and fulfilment. This concerns in particular the passing on of application documents to our clients. As far as the personal data are necessary for a placement, this does not come off, if the data are not made available. So-called cookies are used on our website. When you visit the SUITS. pages, these programs provide information to automatically recognize you. This recognition is based on your IP address stored in the cookies. This recognition happens due to your saved IP-adress in the Cookies. We use qTranslate, which stores the language selection (DE/EN) and prevents the user from having to change the language each time he visits the website. The language setting is stored for one year. You can prevent cookies from being stored on your hard disk by selecting “do not accept cookies” in your browser settings. However, this may result in a functional limitation of the SUITS. website. We would also be pleased to inform you about our services. For this purpose we would like to use your address data to inform you if apllicable about innovations and to remain in contact with you. The legal basis for data processing is Art. 6 para. 1 sentence 1 lit. a DSGVO in connection with your consent, insofar as you have given it, or Art. 6 para. 1 sentences 1 lit. b and f DSGVO. The provision of personal data is neither required by contract nor by law. You have the right to free information about your stored personal data, their origin and recipients and the purpose of data processing as well as a right to correction, blocking or deletion of these data at any time. You have a right of objection against the processing and a right to data transferability at any time. If you have given your consent for data processing, you have the right to revoke your consent at any time without affecting the legality of the processing carried out on the basis of the consent until revocation. You can contact us in writing at any time at the address given in the imprint as well as for further questions on the subject of personal data. Stored personal data will be deleted if the user of the website and/or client revokes his consent to storage, if knowledge of such data is no longer required to fulfil the purpose for which they were stored or if their storage is inadmissible for other legal reasons. Data for billing and accounting purposes are not affected by a request for deletion. Without prejudice to any other administrative or judicial remedy, any data subject shall have the right of appeal to a supervisory authority, in particular in the Member State where the person resides, works or is alleged to have infringed, where the data subject considers that the processing of his personal data is contrary to this Regulation. The supervisory authority to which the complaint has been lodged shall inform the complainant of the status and results of the complaint, including the possibility of a judicial remedy under Article 78 of the Federal Data Protection Act. By entering and confirming your personal data you declare your consent to the processing and use of the data described above. This data protection declaration is valid from 01.04,2018 for all websites for which SUITS. is responsible.